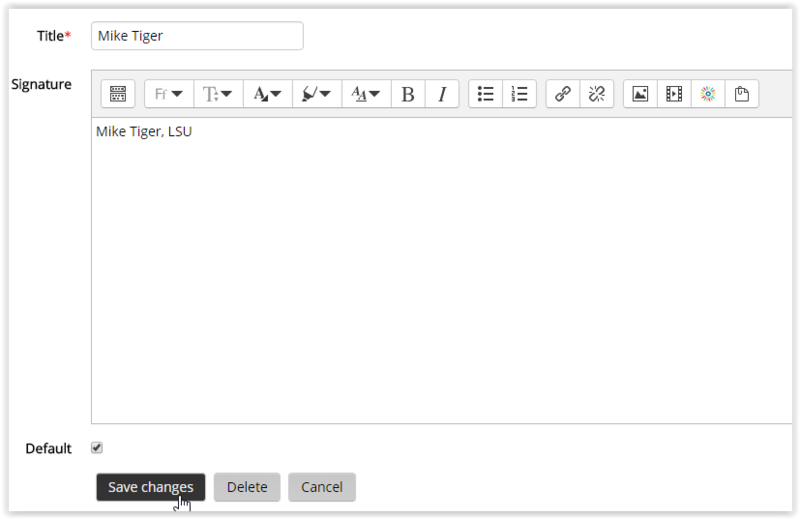 When using Moodle Mail, users can create one or more signatures to insert into the body of an email they are composing. Creating a signature saves it for use in any course. 1. Access Moodle and enter your desired course. 2. 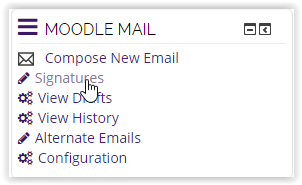 On the Moodle Mail block, click Signatures. 3. On the next screen, enter the title of the signature as well as the signature itself. 4. If you would like this signature to be the default, be sure to check the box. Once you are finished entering the signature, select Save Changes. 1. 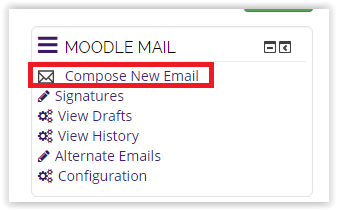 To apply a Moodle Mail signature while writing a new Moodle mail, first select the Compose New Email button in the Moodle Mail block. 2. A Signatures dropdown box should be available at the bottom of the screen. Choose the signature you would like to be added to the email. 3. Click Send Email when finished.